Blogging can be hard. If you’re not a natural-born writer, or even if you are, the idea of sitting down to write a 1,000-word article can be daunting. But that’s not to say we don’t like sharing content. The popularity of social media networks can testify to that. On the other hand, we love blogs because they allow us to express ourselves and share ideas, which in turn, encourages more thought and learning. They allow for ‘freedom of the press’ and ‘freedom of information’ at its best. Anyone can start a publication nowadays with the lowest barriers to entry we’ve probably ever seen in history. But, like I said, blogging can be hard. WordPress has an amazing feature to encourage shorter, quicker, and thus more frequent blogging. It’s called Post Formats and it’s highly under utilized. This article will make a case for using Post Formats, since the idea of them has been under debate, experienced some neglect, and created confusion amidst the emergence of a similarly named WordPress feature, Post Types. It’s time Post Formats made a comeback. And they might, very soon. Post formats are not automatically visible in WordPress. They need to be enabled in your theme’s functions.php file and then styled in a CSS file. For more advanced designs, they need to have templates coded for them. There are themes and plugins that can take care of this for you automatically, if you are not a coder. But this article is not going to show you the ins and outs of setting up Post Formats. The web has done justice to this already. What are WordPress Post Formats? Twenty Eleven Post Formats – What Are They and Why Should I Care? WordPress Post Formats originally came out when WordPress 3.1 was released in February 2011. It was likely a response to the popularity of Tumblr, which now has more blogs than WordPress.com. Tumblr’s style is to offer a micro-blogging format to users. This basically makes it easy to blog more often in shorter bits. It’s a cross between a social network sharing and ‘real’ blogging. The idea is simple: if it takes less work, people will do it more often. No wonder it’s so popular. When Post Formats came out as a core functionality that could be voluntarily enabled in WordPress, the influx of Tumblr-style WordPress themes also surged. Since then, the feature seems to have died off a bit, as many developers seem not to use the feature (see the comment responses to this article). StudioPress, one of the largest WordPress theme providers, has dwindled their Post Formats-designed themes to just Mindstream, which hasn’t yet been updated to HTML5. (Their first Tumblog-style themes included Tapestry, which is no longer featured). You also can’t filter their themes to find a pre-included Post Formats feature, which is a shame since it makes for a strong selling point. WooThemes allows a “Tumblog” theme search filter, but currently only has three “Tumblog” themes available (at time of writing), when it used to have at least eight. These use their in-house, WooTumblog plugin (which can also be used on external themes). They never appeared by ‘default’ in WordPress installations, and still require a coder – someone who knows how to open and use a functions.php file – to enable them. Upon enabling, they require design work by developers before non-coders (i.e. content creators, theme purchasers, etc.) can visually see what they do. 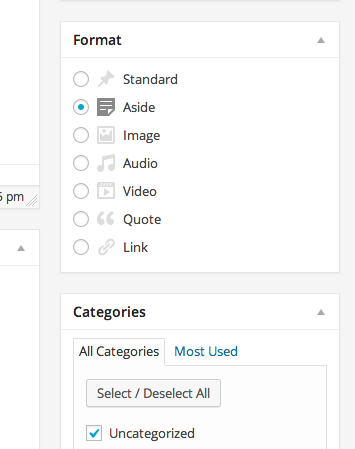 After the above two steps are done, they don’t occupy a prominent position in the UI of the WordPress Post Editor. In short, they were, and are still, hard to explain to the end users. That doesn’t mean they’re not useful, and certainly doesn’t mean they don’t have potential to be an integral part of WordPress. According to Stephen Turbeck on Boxes and Arrows, when something takes too much effort to learn, it’s less likely to be engaged with. Our battle with Post Formats is about removing the obstacles to learnability. It’s one of those features that has so much potential, but it really falls short in usability and honestly we haven’t really taken the time to truly show what it can do. However, since the release of 3.6 was being held up circa mid-2013, Mark Jaquith, the lead WordPress developer, decided to pull out the new UI, make it a plugin for a while, and then bring it back sometime later. Perhaps coincidentally, Yahoo bought Tumblr in 2013 and questions about ownership of content arose, with “tens of thousands” of Tumblr users making the switch to WordPress. So the new UI that would have made WordPress a lot more similar to Tumblr’s layout may have been refreshing to those converts, and we would have seen the feature take off. But the wait persists. We are likely approaching the ‘bring it back to the top of the list’ stage soon, since Mark was interviewed saying the new UI might make it into 3.9. WordPress has already released 3.8 (at time of writing). However, a recent article on WP Tavern discussing proposed 3.9 features did not mention Post Formats as of yet. Arguments For and Against Post Formats: Does it Really Matter How They’re Implemented? Some may argue that a feature like Post Formats should not be included in WordPress core. This is because it is not an essential feature that all users will employ. This is a valid case, since that is why the plugin repository exists; people who want to extend WordPress with more features should be able to do so, while leaving the ‘base’ CMS simple enough to be adopted by a larger, more generic user base. Not everyone needs Post Formats, so not everyone should be forced to have them. On the other hand, we can also argue that many parts of WordPress are non-essential. Do we all use date-based archives? The popular WordPress SEO by Joast De Valk discourages them because they create duplicate content. Shouldn’t WordPress focus on things like creating better search? If features like Post Formats make it to core because bloggers love them, why not make JetPack features part of core too, if they are so essential to the blogging world? Whether Post Formats stay part of core or part of a plugin doesn’t really matter. The content producers, their primary users, won’t notice a huge difference either way. The main objective should be that more people are aware of, and start using them. They will make blogging more effective, more fun, less strenuous and less intimidating. So why Post Formats? Surely there are other ways of making blogging more prevalent. For example, can’t users just post shorter posts? Well, yes, they can. But Post Formats are styled differently, which makes them more motivating. They’re not really a new functionality as much as a new way of using an existing feature. They allow a blog’s design to have things like ‘Photo’ posts appear without a post title or date stamp; just a photo, since that’s all it is. Then, to make it clearer that this is a ‘Photo’ post, you can add an icon, a different background colour, or other CSS styles to distinguish it from other types of posts. Same goes for ‘Quote,’ ‘Gallery,’ ‘Video,’ ‘Audio’ and so on (there are 9 supported Post Formats). Post Formats help organize a blog and allow readers to filter through the types of content they want to find. It’s an alternative and, I would argue, a better way to set up a taxonomy. Categories and Tags relate mainly to subject matter. Custom Post Types are mainly for non-blog content and improving back end administration. Post Formats allow users to find blog content by kind. In an age when content marketing is becoming essential to online business success, Post Formats may be just the answer WordPress users and content creators are looking for. If every post necessitated using all the customary features of a ‘Standard’ article, then a user might feel obligated to formalize content with a title, summary, category, and so on, to justify only wanting to post one meme or infographic, for instance. Sometimes, posting frequent snippets from other blogs (without copyright infringement) is a great way to prevent your blog from going stale. So is any excuse to engage with readers. And no, quality doesn’t have to suffer in the interest of quantity. See this great video on why Quality vs Quantity is a False Equivalence. Posting is the single most important thing you can do on a blog. That’s what a blog is. No matter what your blog does, whether it’s a photo blog or a music blog or a make-fun-of-celebrities blog – whatever it is, the blog doesn’t exist until there’s a post. And the health of a blog is likely related to the activity level of posting…it’s one of these things that gets lost in the WordPress world, especially among developers and designers. You think about themes, and what functionality can we add…if there’s no post, what’s the point? Some of that is just about usability and feature design. But there’s other end, which is motivation. 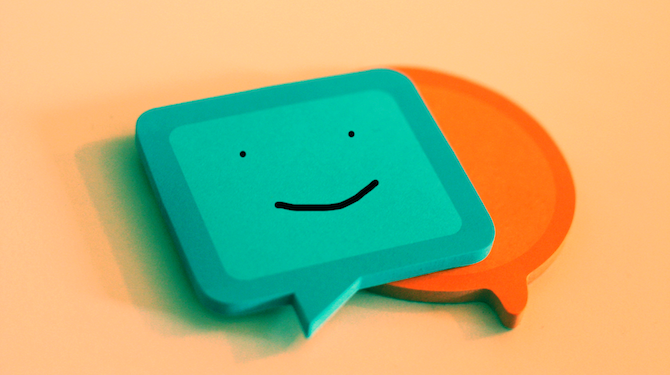 So we see there are two aspects to encouraging more posts: features and also motivation. I recently set up a site for a client who wanted to begin publishing unique ideas about technology in education. In addition to lengthy articles, he also wanted to post links, videos, quotes, and other resources to help make the blog useful and attractive to stakeholders in the education world. Does he need to write his own commentary on the latest TED Talk about video usage in classrooms to justify sharing the video in the first place? No. That’s what Post Formats are for. Give the post’s design a video icon, and the user knows this post is only meant to be a video, nothing else. Post Formats get even more useful than that. This client also invites guest contributions, but wants to separate those out in their own space, without creating a separate blog for them. After all, they all contain related content. Having a WordPress Category dedicated to ‘guest contributions’ means that a contributor can post any kind of Post Format content: a ‘link,’ an ‘image’ (such as an infographic), a ‘video,’ and so on. Now, with Post Formats enabled, the blog can encourage all types of author submissions, keeping the blog even more frequently active. They create URLs that will appear ‘useless’ to Google, falling far short of the recommended 300-word minimum that the folks over at Yoast.com recommend. Google is getting stingier with how they crawl and what they are willing to index. If they will only index 100 pages for x units of PageRank then having nearly 100% of a 100 page site indexed is far better than having 40 or 50% of a 200 page site indexed. They have potential to create duplicate content issues, since multiple archives of taxonomies will start to show the same content on different URLs. Depending on their design, they could remove essential aspects of SEO optimization on a post, such as an H1 tag or Page Title. The best way I could think of to solve the above problems was to use no-index settings options that come with the WordPress SEO plugin and likely with others too (WordPress SEO is installed by default on all my sites, so I am more familiar with it and will use it as our example here. The principle is the same with any method you chose to do this with, even if it is manual). Unlike with ‘Standard’ Post Formats (i.e. a ‘usual’ WordPress blog post), I would opt to no-index the single URLs where the Post Formats exist individually. I would then be sure to index the archives where Post Formats occur. The reason for this is that eventually the archive pages will be full of content, thus eliminating the ‘barren content’ issue. But — and this is a big but — before you try to index any Post Format, ask yourself why you would want users to find this, and how worthy you are of search engine ranking. If all you are doing is publishing content from other sources, your archives may be full of duplicate content. So it won’t be useful to try to index them at all. You could try to use the canonical rel link, but that will get complicated. Also, if your archive is only videos or images, you’ll still have a URL with no text on it. So your ‘barren content’ issue won’t be solved. As a solution, you could add an Intro text area to the top of these archives to help its value perception in the eyes of search engines. 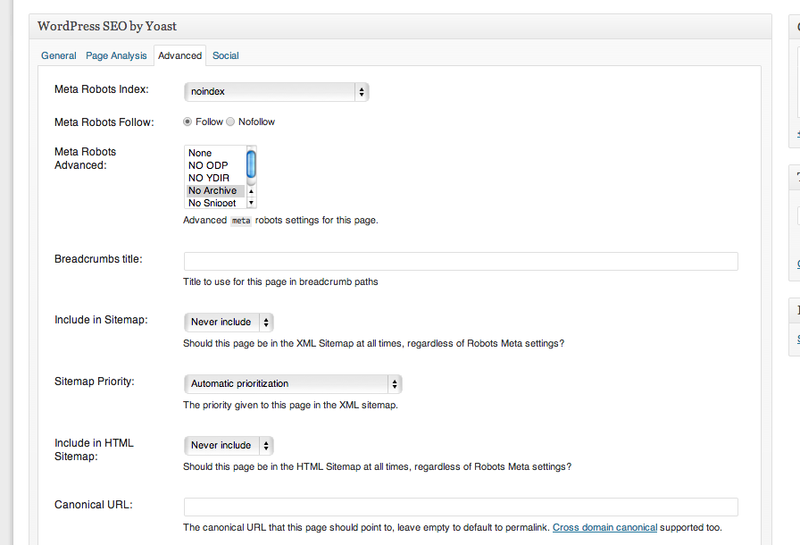 Setting up noindex rules on a per-format archive basis will require manually setting up a robots.txt file as far as can be seen with the WordPress SEO plugin. Like Dan, I also welcome any other ideas or comments about handling SEO with Post Formats. To Conclude, Let’s Bring Back Post Formats! As we’ve demonstrated, Post Formats are a highly useful, yet under utilized feature. It’s like most people weren’t impressed enough by them to keep their ‘thunder’ going, or the users just didn’t ‘get it.’ That means its up to us – the developers, e-marketers, WordPress bloggers, contributors and the ones who know about the power of Post Formats to help spread their awareness. Yes, the option is there, and has been for a while (even before they become official in WordPress 3.1). But we’re not taking advantage of them when they could make our blogging lives so much more fun, engaging and motivating. I say, bring ‘em back WordPress community! In WordPress (like you mentioned) one can show a list of posts of a certain format by adding ‘/type/[format]’ for example ‘/type/status’. However, it seems not to be possible to show a list of posts of the format ‘standard’. Thanks for the great article on post types. I just played with it for the first time today and shared a quote post. I never considered negative SEO impacts of this kind of post though… I’ll have to cinsider that no index button though I did manually edit my URL and added the required SEO info to All in One SEO Pack. Thanks for giving us information about the advantages of post formats of word press over traditional blog commenting due to the reason that traditionally one has to write a content ranging from 500 to 1000 words for a genuine blog comment where as in post formats one can blog comment in a much shorter way thus making it more convenient and useful for the user and thus increasing its popularity among the end users.Through post format we love to share ideas,information etc through blog. Post formats are very useful but its up to the developers, e-marketers, WordPress bloggers, contributors to known about the power of post format. When I first started out blogging, I chose a theme with post formats so now, post formats is a major selling point when choosing themes.